On March 7 at CloudConnect 2011, GigaSpaces announced that it's second-generation cloud enablement platform is slated for release in second quarter of 2011. The new cloud-enablement features will be available to existing customers already using GigaSpaces eXtreme Application Platform (XAP) and specifically addresses the needs of new and existing customers for a PaaS and SaaS enablement platform. § Silo-free architecture that is a converged end-to-end application and data environment enabling cross-stack elasticity, multi-tenancy, unified SLA-driven performance, central management and simplifying development and operational processes. § Cross-stack fine-grained multi-tenancy from the web tier down to the customer and data object levels that is user, data and application policy-driven. This provides easy management and monitoring through a comprehensive management console enabling full control, security, and crystal clear visibility over all of the multi-tenancy aspects of the application. § Built-in DevOps to uniformly manage and automate the lifecycle of the entire application middleware and its resources, dramatically reducing operational and development complexity. § Out-of-the-box third-party middleware management (e.g. Tomcat, Cassandra, JMS) that automates and manages all application middleware services during deployment and in production. § Openness, providing effortless portability, multi-language and multi-middleware support, along with easy integration with existing processes and systems for private, public, and hybrid clouds. InfoQ caught up with the GigaSpaces team to gather some deeper technical insights. InfoQ: Can you explain the term silo-free architecture platform? Do you mean multi-tenancy or are there some other aspects built into the platform to avoid the silo effect? When we speak about the technology being silo-free we are not referring to the multi-tenancy support, but rather our ability to apply the same automation and procedures to any service managed by the product, regardless of technology or vendor. By providing a generic, customizable service grid that can deploy, start, restart, stop, scale out , provide failover, and undeploy (retract the deployment of) any service, we enable the bridging of applications and convergence of development with operations. Operations can provide their scripts and knowledge to customize the specific service to be deployed, while any IT person be it operations or a developer can easily deploy the entire set of application services using a simple shell command to package and deploy. 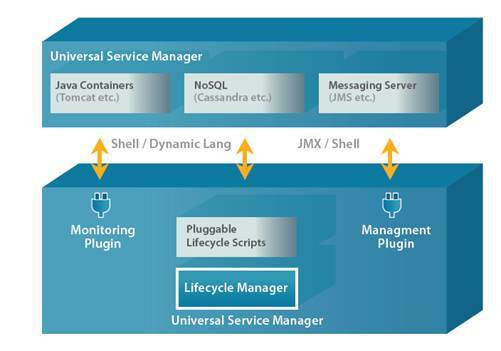 In addition the universal service manager enables the client to plug our framework into any monitoring and management API that is exposed by the managed service to receive metrics and for management purposes. This is possible by configuring a generic mechanism that uses standards such as Shell, JMX, and SNMP.The diagram below illustrates how this works. Nati Shalom, CTO and Founder of GigaSpaces has also shared a presentation on the GigaSpaces blog that discusses deploying, scaling and monitoring Cassandra using the Universal Service Manager(USM). InfoQ: Is elasticity policy driven and what are some of the interesting knobs and dials available? There are scaling out and scaling down rules based on various performance indicators such as CPU utilization, transaction throughput, memory utilization, web request latency, and more. The API is completely open so you can also implement your own scaling policies. One thing we’re thinking about adding is using a sort of rule-based engine to allow users to define scaling rules more easily, without even requiring any coding. InfoQ: What phases of the application are managed by the DevOps component? InfoQ: What is the value differentiator from other leading PaaS/SaaS enablement offerings from a technical perspective? Support of any middleware service for PaaS scenarios without requiring any changes to architecture. Support for multiple frameworks and APIs for SaaS scenarios, which basically provides the capability to run any combination of application middleware on top of any cloud technology, as well as transparent cloud portability between private, public, and hybrid cloud solutions without any implementation changes. For all application deployments and middleware services from the application to the infrastructure resources, in addition to providing an integration point with other OSS platforms. Through a scalable application platform specifically geared for SaaS scenarios, continuous deployments are made possible through the schema-free data model that enables functionality changes without any downtime, in addition to the built-in real-time backup and self-healing capabilities that ensure a reliable and always available service. At both the deployment / service level and at the data level that provides a built-in cross-stack fine-grained multi-tenancy policy from the web down to the customer and data object levels. And of course the silo-free approach that provides a real solution for business agility and efficiency through the DevOps framework.